On January 23, Tiger beer officially inaugurated a new bridge at Hamlet 7, Tam Hiep commune, Chau Thanh district, Tien Giang province. This 30-meter-long bridge is made partially from recycled Tiger caps that were collected over a three-month campaign and melted down to help make the bridge. The bridge connects Tam Hiep Commune, Tan Ly Dong Commune of Chau Thanh district and Tan Lap 1 of Tan Phuoc district, and will make the daily commute much less challenging for local people. Tiger launched this innovative project three months ago in Tien Giang province. 70 participating Tiger outlets collected a total of over 520,000 caps, equivalent to over 1 ton of caps. These caps were donated by Tiger drinkers and outlet staff then transferred to Tiger’s recycling partner - My Nga Environmental Services Company, a reputable company licensed by the Ministry of Natural Resources and Environment with 15 years of experience in recycling business. At the recycling factory, these caps were processed at low temporatures to prevent harmful emissions to the environment and mixed with other materials to create raw iron used for building the bridge. As Asia’s No. 1 international premium beer, Tiger leads the way in bringing world-class experiences and promoting responsible consumption to Vietnamese youth. Tiger has inspired millions of Vietnamese consumers to uncage their courage, seize the moment and turn possibilities into actions. Understanding that Tiger consumers always seek out new experiences and bold ideas, Tiger beer constantly strives to be part of unique moments that represent originality and authenticity. Tiger has previously been involved in global innovative environmental campaigns such as AirInk, where an innovative prototype was launched which turned harmful car and motorbike emmissions into ink that was used in beautiful murals and artworks. Now, for the first time ever, Tiger beer inspires its drinkers to make a postive impact on the local community by recyling bottle caps into something meaningful for the local community. The idea behind this project is bold yet simple: by donating Tiger bottle caps, consumers can support Tiger’s recycling effort to reduce waste and, at the same time, improve vital infrastructure for the local community. “On behalf of the local community in Tien Giang, we thank Tiger Beer for building a new bridge at Hamlet 7. I highly appreciate this project which helps raise public awareness on environmental protection and recycling. The new bridge will also make the daily commute much less challenging for local people here in Tien Giang. 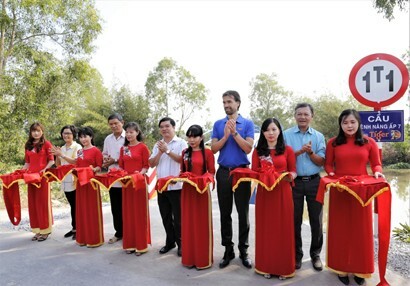 We hope that the local community and Tiger consumers across Vietnam will continue to support this project by recycling bottle caps so we can build more bridges in remote areas in the time to come,” said Mr. Nguyen Thanh Hai – Deputy Head of National Assembly Delegation in Tien Giang province. As a premium beer brand of HEINEKEN Vietnam, the most sustainable company in Vietnam for the second consecutive year, this Tiger campaign further enhance HEINEKEN Vietnam’s recycling effort on its journey of Brewing a Better Vietnam. In 2017, HEINEKEN Vietnam created virtually zero waste that went to landfill with 99.01% of its input materials being re-used or recycled, with less than 1% lost or sent to landfill. Following the success of the project in Tien Giang, going forward, this campaign will expand across Vietnam with Ho Chi Minh city as the next destination and more bridges to be built nation-wide. HEINEKEN Vietnam was established in 1991 and operates six breweries and nine sales offices across Vietnam. From humble beginnings with only 20 employees in Vietnam, HEINEKEN Vietnam is now the second largest brewer in Vietnam with more than 3,000 employees. HEINEKEN Vietnam makes a significant annual economic contribution to Vietnam, amounting to approximately 0.88% of the nation’s total GDP. In Vietnam, HEINEKEN produces and distributes Heineken, Tiger, Amstel, Larue, BIVINA, Desperados, Affligem and Strongbow cider. HEINEKEN has six breweries across Vietnam, in Hanoi, Da Nang, Quang Nam, Ho Chi Minh City, Vung Tau and Tien Giang. In 2017 and 2018, HEINEKEN Vietnam was recognized as the most sustainable company in Vietnam by the Vietnam Chamber of Commerce and Industry (VCCI) based on the annual Corporate Sustainability Index.